The downstairs smells like Easter. The ricotta pie is out of the oven. 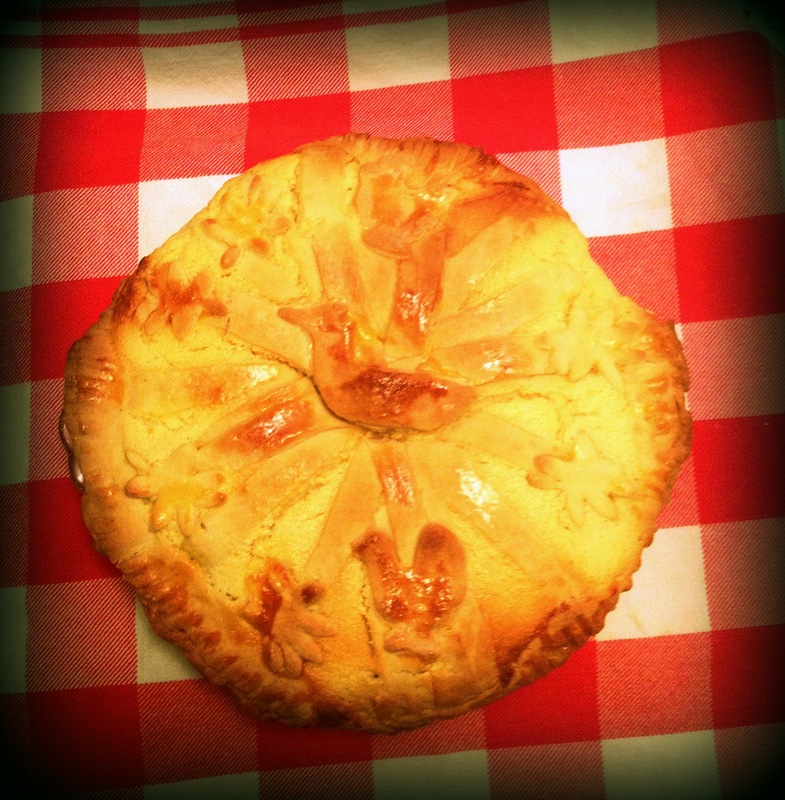 I baked a ricotta pie with a sweet crust. 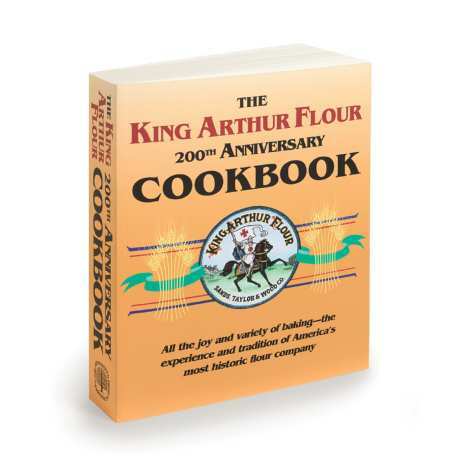 The recipe is the one out of my King Arthur Flour cookbook, tweaked. Add cardamom for one. The recipe calls for grated orange peel in the ricotta mixture and a double crust that is sweet. I played with the crust to make it not so double crust boring – I have collected vintage cookie cutters for years, so I got some out to use to creat fun cut outs with the dough. 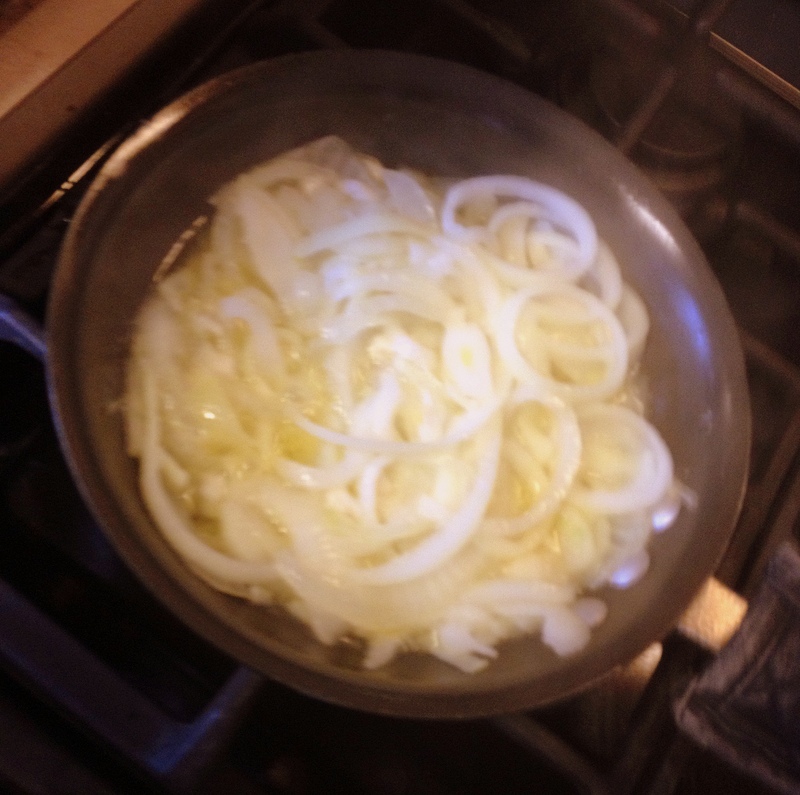 In a large Dutch oven, sauté one large sweet onion and one medium-sized regular onion cut into very thin rings. Add oregano, and basil. A little marjoram. And kosher salt to taste. When almost at the point of caramelization, add 1/3 cup good balsamic vinegar. Allow vinegar to mostly cook off, leaving a darkish sauce in the bottom. 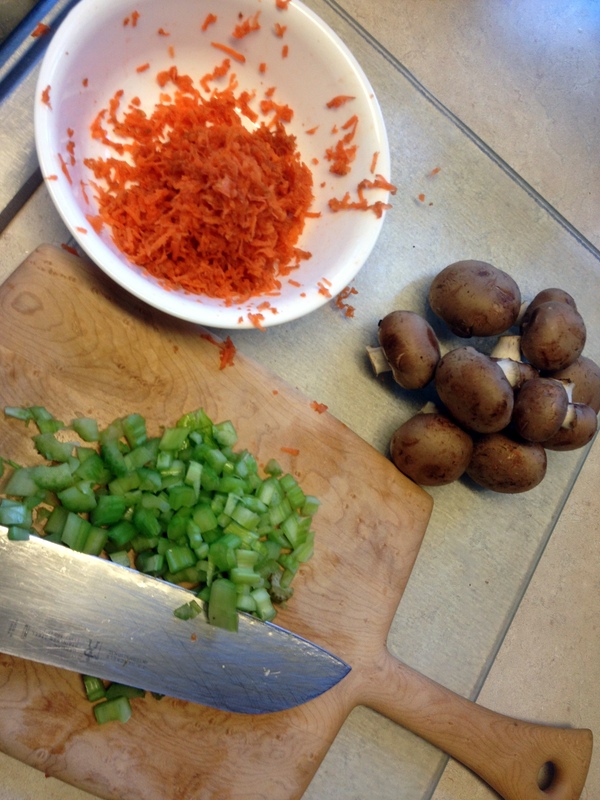 Add to this two grated carrots, two fresh bay leaves, and 6 ounces of chopped baby Bella mushrooms. Next add one package of ground veal. Add one package of ground pork. As the meat cooks down and browns slightly (ground veal and pork do not brown like ground beef), add one-third of a cup of 2% milk or half-and-half. 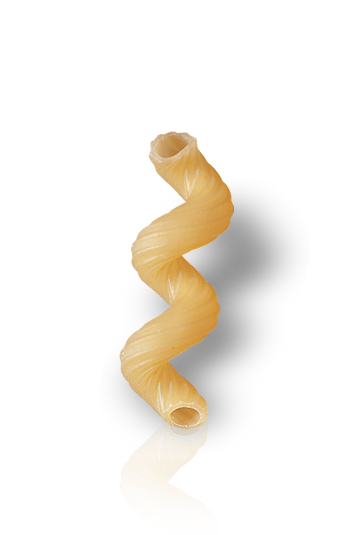 Cook spiral pasta, as in the spiral shaped pasta that is called cavatappi. 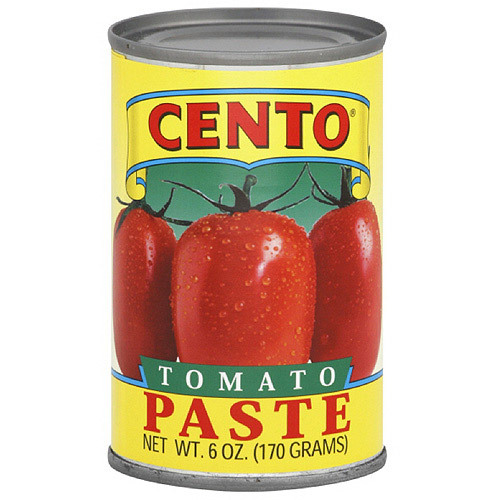 You can also use ziti. 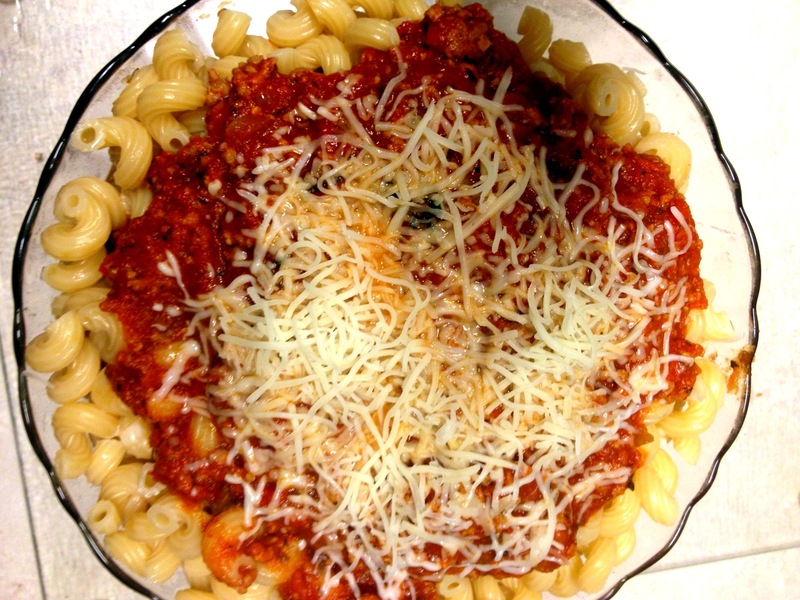 Get out your giant pasta serving bowl and ladle some of the sauce into the bottom. 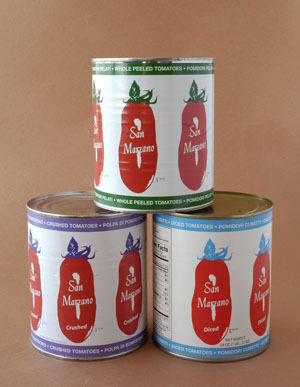 Next add on top of that sauce a third of the pasta you cooked – I cook the whole 16 ounce box. Ladle more sauce on top, and repeat the layers twice more. Top off with a little more sauce and cheese and some more fresh parsley. Served with a salad, pasta coma guaranteed. Sounds a bit dramatic, but it got your attention, didn’t it? 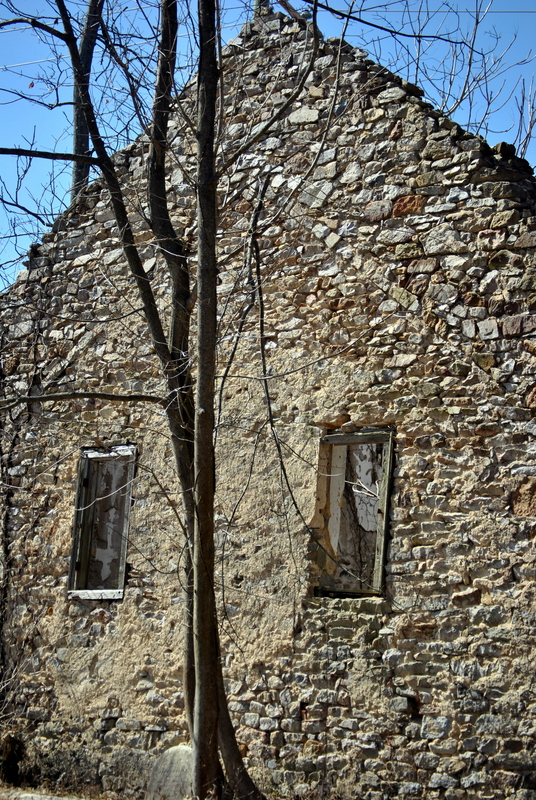 On Good friday, one of the holiest of holy days, I ask you to remember a small but historically significant church that is rotting in Frazer in East Whiteland Township, Chester County. It is on Bacton Hill Road and it is Ebenezer AME Church. 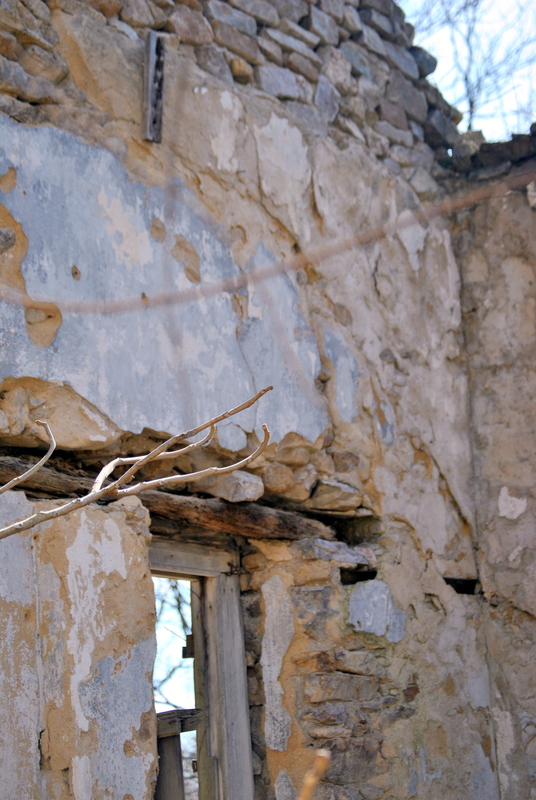 It started as a fascination of a ruined structure that I later received more information on. 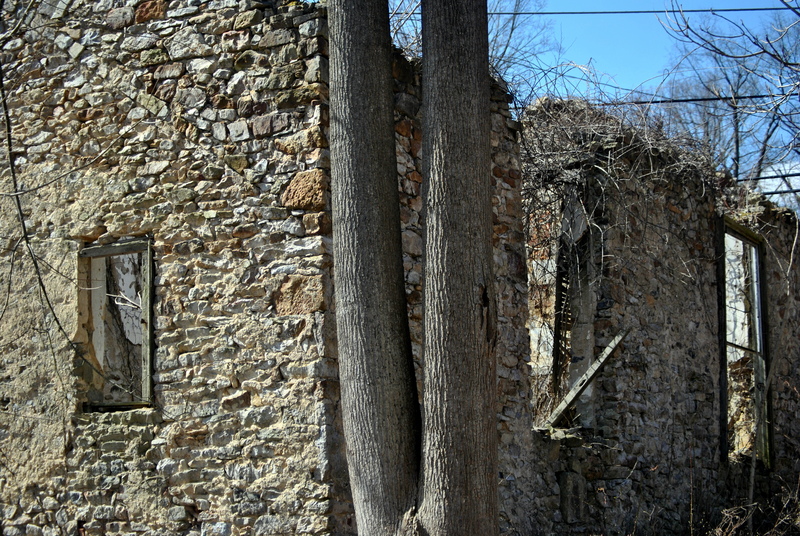 Ebenezer AME in Frazer was built in 1835. 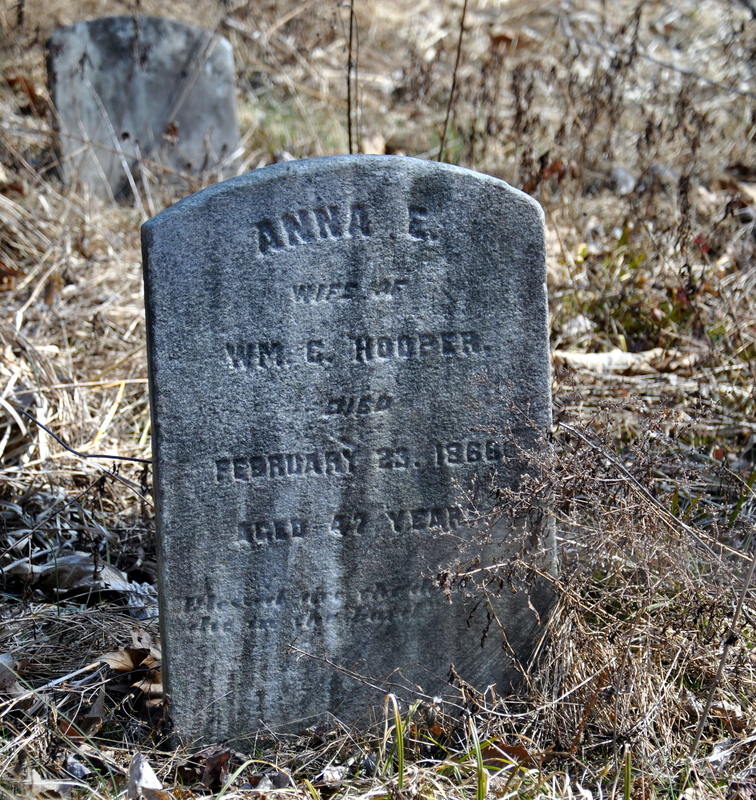 Apparently the oldest grave stones in the cemetery date back to the 1830s. 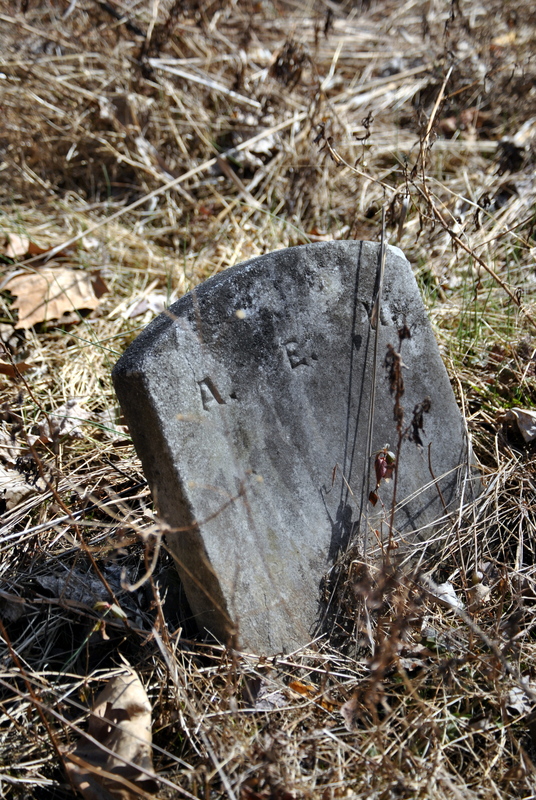 An Eagle Scout named Matthew Nehring had been working on uncovering the gravestones. (Have no idea if his project is finished.) According to the photos it appears some of the dead buried here are soldiers and veterans. 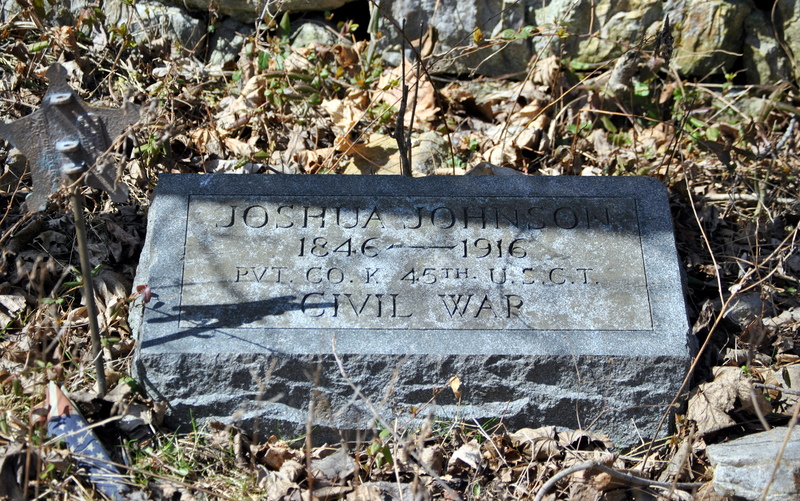 One gravestone is for a Joshua Johnson (Pvt., Co. K, 45th Reg., United States Colored Troops (USCT) (Civil War). I find this to be incredibly historically significant as the army began to organize African Americans into regimental units known as the United States Colored Troops (USCT) in 1863. According to the East Whiteland Historical Society (which I am not sure what they do because all I see are historic structures rotting in East Whiteland) this church used to serve as a “hub” of African American society in Frazer. So again on Good Friday I ask again why isn’t any of it being protected? In any Christian religion, Easter is a very big deal. 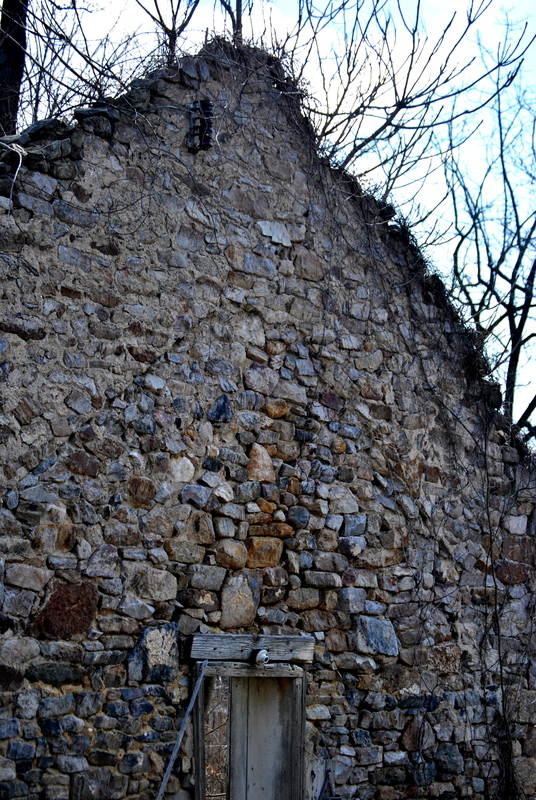 Imagine Easters of the past in this little church. Ladies and gents in their Sunday best, the ladies sporting spring hats. The laughter and joyful sounds of children outside after services have concluded? The pastor standing outside wishing his congregation well and God speed? 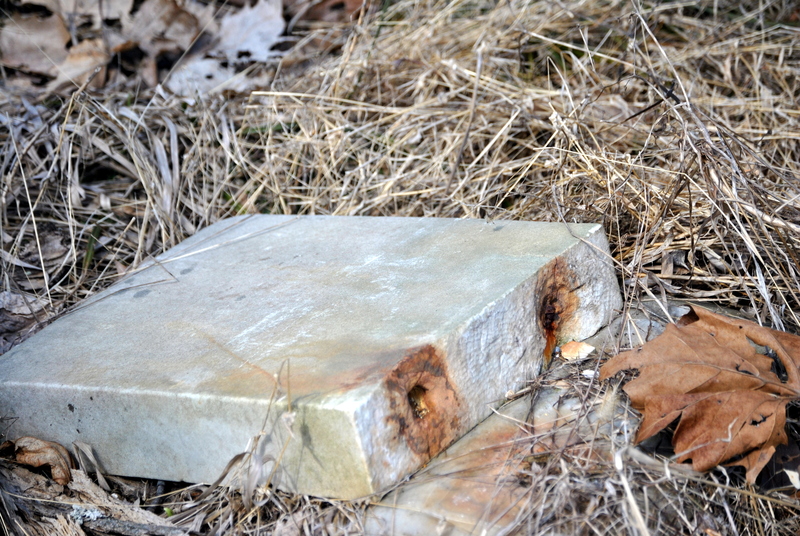 A reader of my blog tells me County records indicate that the lot is owned by the “African Methodist Episcopal Church”. This online directory shows the a church in Malvern – St. Paul’s. I am going to e-mail these posts to AMEC and see if they will care. Certainly no one else I have e-mailed to date has appeared to care. 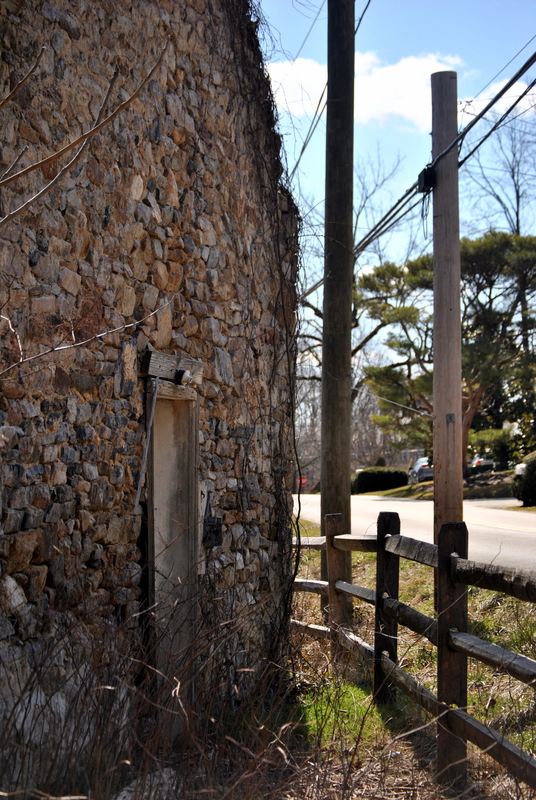 I appreciate the writer’s interest and concern about the considerable historical resources in the Township , and the ongoing need for protection of structures such as the Ebenezer AME Church, a recent focus of beginning conservation planning. 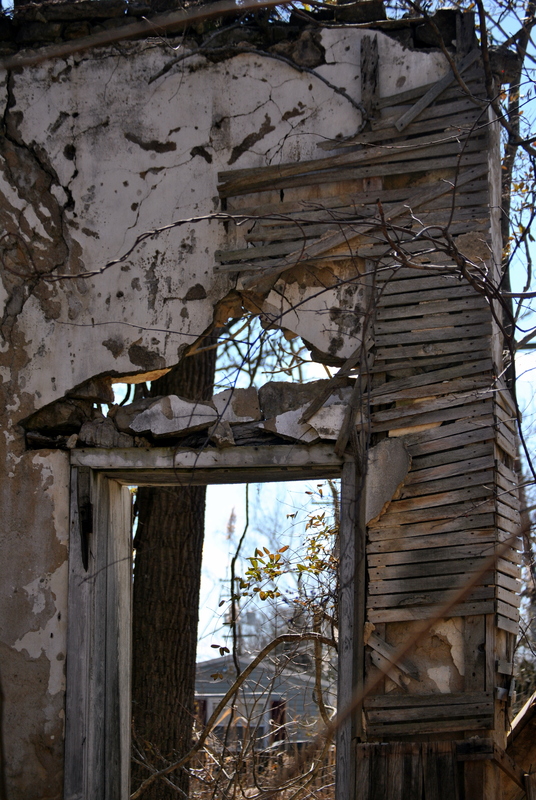 All of us shudder when we pass a formerly stately structure crying for help. He continues with what East Whiteland has done in the past, and well, the past is the past. What is going on today? 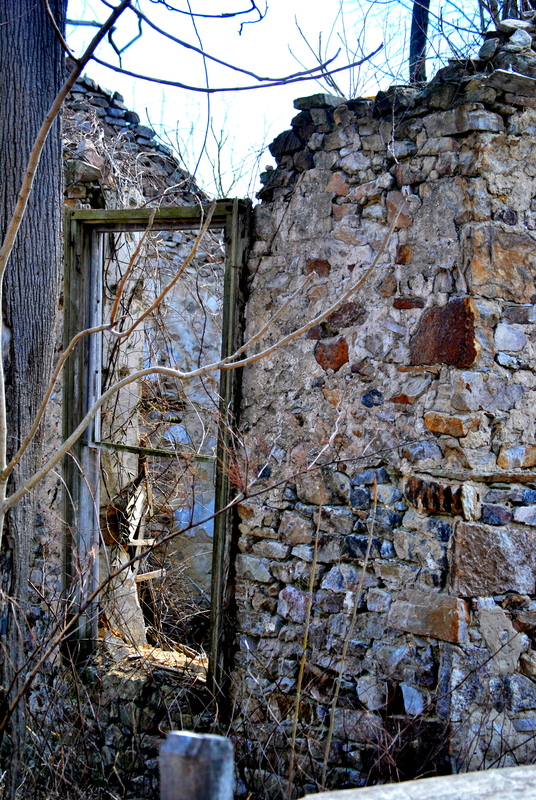 I am going to not try to sound harsh, but what is it they do besides bemoan the fact that a heck of a lot of history in East Whiteland is rotting? Loch Aerie, Linden House, and more? For example (I do not know all the municipal boundaries so feel free to correct me) but isn’t part of Duffy’s Cut that Amtrak won’t allow any more archeological digs on in East Whiteland? Is the mass grave important enough that maybe another marker closer to the actual site is in order? I get that part of the problem is East Whiteland has probably more commercial zones than residential so why not get smart with zoning and planning? Is it possible to write into ordinances and make conditions of approval that not only include these developers to improve the roads and infrastructure, but to kick in towards the preservation? I mean seriously they have developers with huge, deep pockets like Brian O’Neill and Eli Kahn, right? I mean Brian O’Neill is Catholic with a sense of religion, right? Why couldn’t they ask someone like him to save a church? Help get another historical marker closer to the actual location of Duffy’s Cut mass grave (Where AMTRAK halted archeological digging) ? Or help find a conservation minded buyer for say Linden Hall or Loch Aerie? Both developers and their partners have made noises out here and elsewhere about how their developments add to the character of an area, so why not have them put their money where there mouths are on historic sites? Paoli Battlefield and Battle of the Clouds are important, but why is it I see neighboring municipalities succeeding with preservation efforts? Historic Sugartown, Historic Goshenville, and even though sometimes I think they need to do more, Historic Yellow Springs? And again, when you go to East Whiteland’s really poorly designed website and pull up the historical commission you get a big bowl of nothing. I will tell you what, if some of my people were buried in an abandoned churchyard I sure would care. So here is wishing on Good Friday that apathy dies an untimely death and people remember this site before my photos are the only things left standing. Again, I am happy to share the photos I have taken to date. If the African Methodist Episcopal Church were to roll up with East Whiteland to save it, I would continue to offer my photographic skills as a donation as well as my PR talents. But someone other than I has to care, first. 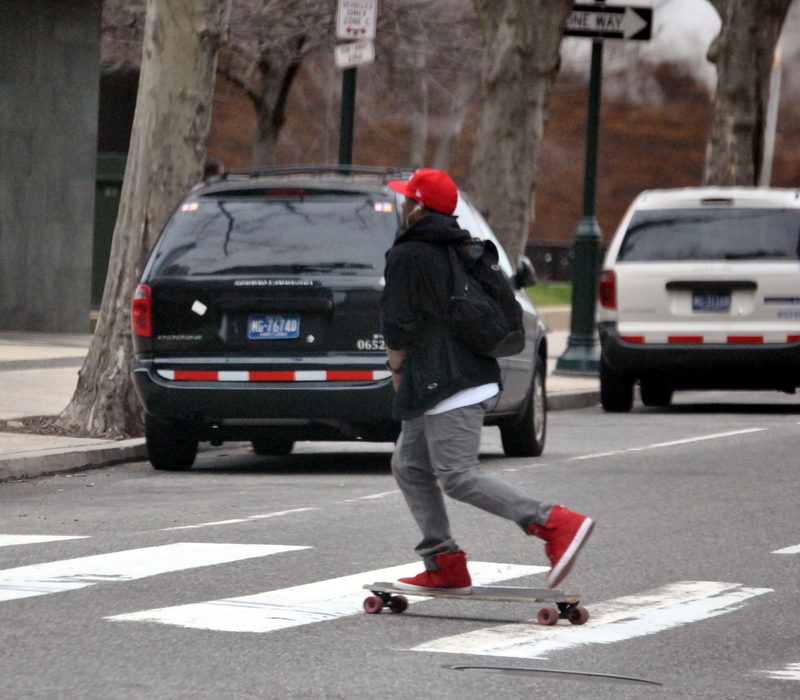 All the confusion over whether or not Gabe Pilotti would go to court in Pottstown and when is over. He did. 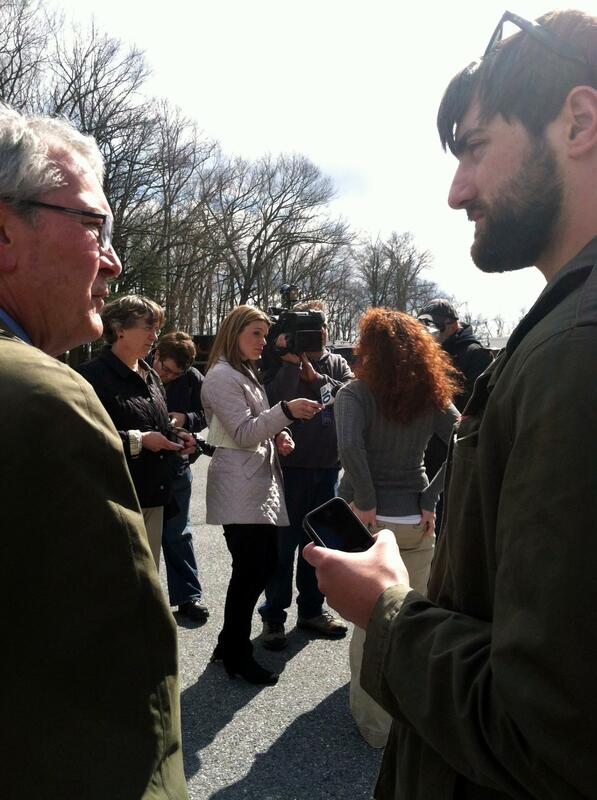 And NBC10 Philadelphia, The Daily Local, The Pottstown Mercury, and others were there. Many thanks to all of them for caring enough to cover. (Links to media coverage will be posted when available). Thanks to Tom Hickey from Dog PAC for being there too. There were also lots and lots of police. Apparently they were there due to death threats received by Pilotti. As an aside, no matter what he has done, that kind of eye for an eye vigilante justice has no place in civilized society. That behavior is not condoned, and the Bocks are quite clear in their desire for the courts to be able to do their job and for laws being able to be created and changed to protect PA dogs. Vigilantism like that makes him the victim, when he is the one who shot defenseless puppies so why do that stuff? SOUTH COVENTRY — A 72-year-old man who shot and killed a neighbor’s two family dogs in February appeared in district court Wednesday as about 15 police officers stood guard outside. What no one seems to know is if Gabe Pilotti’s guns were confiscated pending outcome of case? Shouldn’t they be? (owning guns is a responsibility and did he behave responsibly?) Also interesting to note that no one from district attorney’s office was present. Don’t misunderstand me, they don’t have to be present at this stage but given the public outcry over this it seems they might have made an appearance. Now I wonder if we can get the media to go to a hearing at Judge Cabry’s in Honeybrook next week on April 2nd for a little civil manner involving a horse rescue gal who isn’t always civil? Will this hearing mean more problems for the owner of Off The Track Thoroughbred Rescue? ….As soon as I got home I asked the DA’s office if such a letter came to them, they said they have seen no such letter. I love risotto. It takes a bit of time to do it right, but so worth it. Here is a recipe I have been doing for years. It has lived in my head because the impetus for it came from one I ate growing up that came out of our family kitchen and not a cookbook. Intuitive memory cooking if you will. Hope you can follow. Take a smallish sauté pan and cut up into thin rings one medium regular onion and one medium sweet onion and three cloves of garlic (minced). Toss into a pan with 4 tablespoons of butter, a pinch or two of sea salt and swirl around and cook until nearly caramelized over medium-low heat. 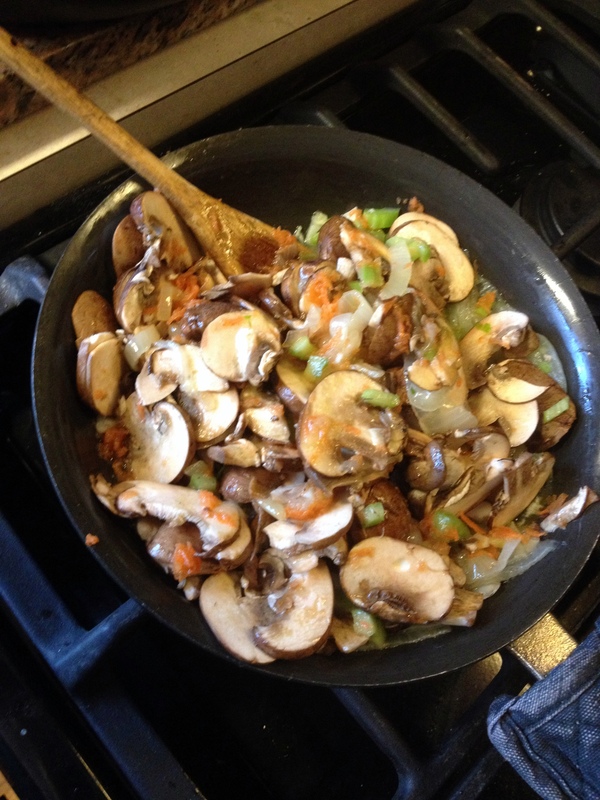 Add 2 cups of sliced baby bella mushrooms – and yes cut your own, don’t buy pre-sliced. Add 2 medium ribs of celery minced. Add 2 medium grated carrots. Allow it to cook down. Remove pan from heat and just move to corner of stove. I had leftovers from a chicken I roasted, so next I cut up the cooked chicken (skin- free) into bite sized pieces. I think about 2 cups, maybe a smidgen more. O.k. now the fun part. Pull out a large fry pan and put a few tablespoons of olive oil in the bottom. Add the 1 1/2 cups of uncooked abrorio rice. 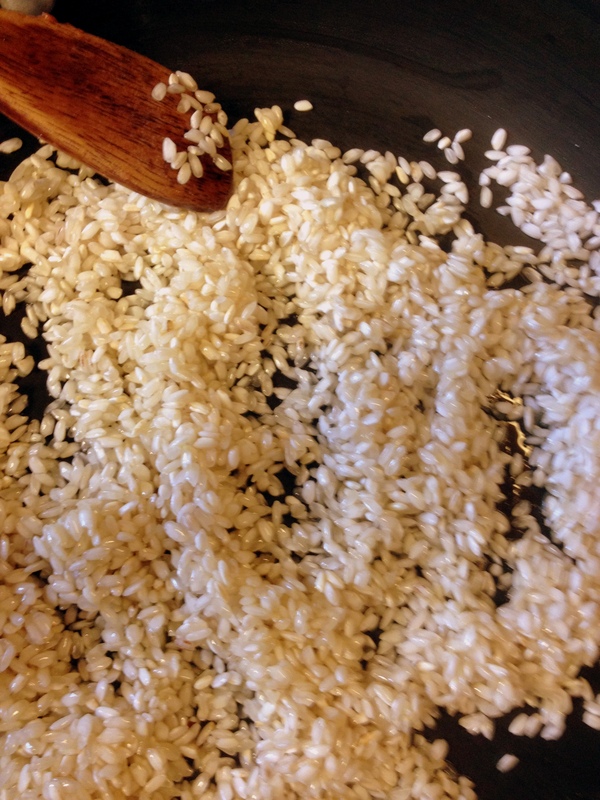 Stir around on lowish heat until rice grains are translucent. Add 1/2 cup of rosé wine (NOT white zinfindel – YUCK! ), stir around until rice absorbs wine over medium-low heat. 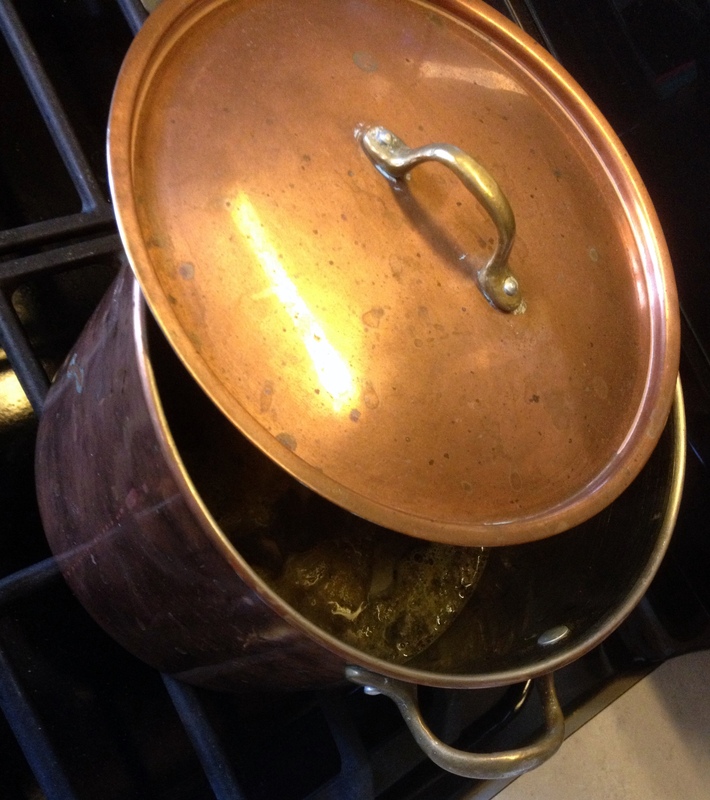 Now start ladling in your simmering chicken broth, one cup at a time. Last night I only used 5 cups of broth, but sometimes I use 5 /12. 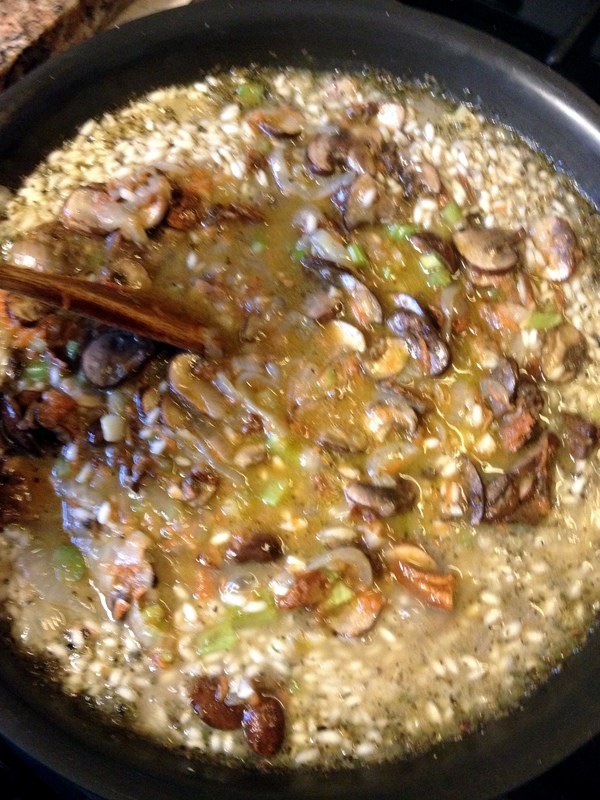 The broth needs to be absorbed ONE cup at a time into the rice. 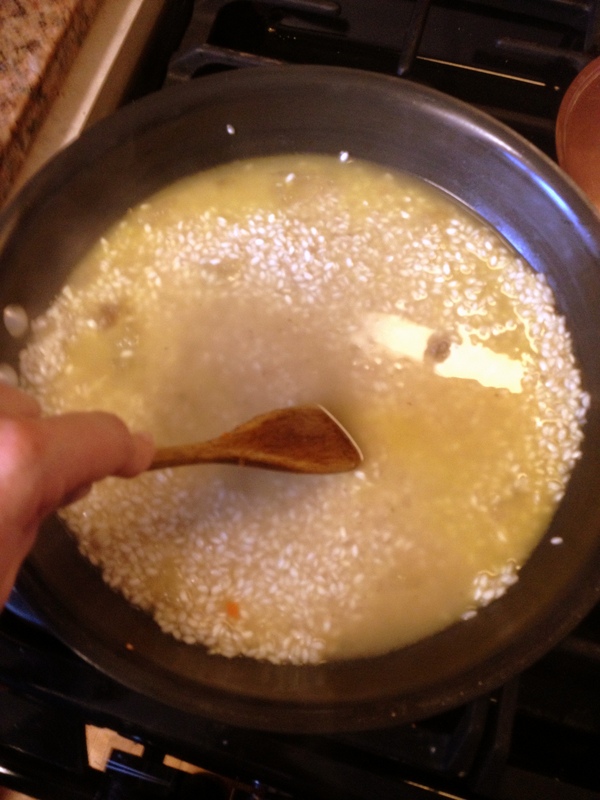 If you just dump all the broth in your risotto will be mushy, gluey and gross. When you hit the 3rd cup of broth almost ready for the 4th add in the sautéed onions and veggies. Half way through the 4th cup of broth being absorbed, toss in the chicken. Also toss in a few pinches of tarragon, basil, and oregano. After you add the final broth and it is almost all absorbed, stir in 1/2 cup of grated parmesan or grated romano cheese. Stir in 1/3 cup rough chopped flat leaf Italian parsley five minutes before serving. The whole add broth process takes about 30 to 40 minutes. I hope I have not left anything out….again….have never written this down – always just done it. 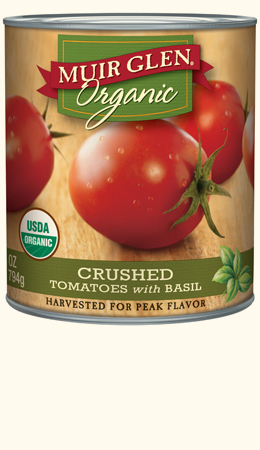 Serve with additional grated cheese on the side and a nice green salad. UPDATE 3.27.13 11:33 a.m: *UPDATE* Tom Hickey from DogPAC just called. He says that his sources have told him the hearing is STILL on for Pilotti (Argus & Fiona) 3 pm at 1130 Ridge Rd in Pottstown, PA. He asks that if you are able to come show support, to please do so in a peacable manner. No one expects this hearing to last more than five minutes – it will undoubtedly get waived to county court. But apparently, he does have to appear. This is all we know and what we have been told. 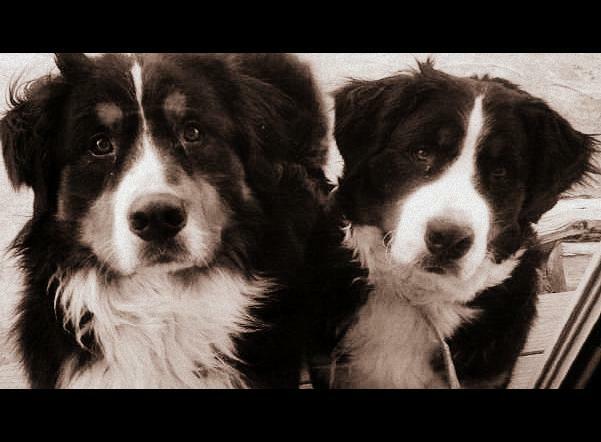 UPDATE 3.27.13 10:08 a.m.: Greetings – this morning greets everyone who want justice for Argus & Fiona with confusion. Some sources say Pilotti has waived his hearing so there is nothing today, other sources say everything is moving dates again. So the long and short of it is, we just don’t know. We will update when we do. Sorry to put folks in a holding pattern. We appreciate your support. Tom Hickey from DogPAC was kind enough to connect and tell us the hearing date had indeed changed….to TOMORROW. YES ANOTHER CHANGE TOMORROW (Wednesday, March 27th) at 3 p.m . If you can be there to show your support, THANK YOU. You know , they can keep changing it and we will still come, 1130 Ridge Road Pottstown, PA 19465 Justice, Love and Change ~ Argus and Fiona ♥ spread the word! And VERY important – out of respect to the dogs and the Bock family, if you go tomorrow, PLEASE just bear witness quietly and show support. No drama or the dogs will lose out. It is my belief this district justice doesn’t want this in his court, but I could be wrong. So we now have ANOTHER change that the court will neither confirm or deny: that the trial is BACK to 3/28/2013 or this THURSDAY as in the day before Good Friday and Easter Weekend. I have to ask why this court date and the times are moving at such an extraordinary rate. Is this a ploy on the part of the defense, a/k/a Gabe Pilotti’s lawyer? Or is it because the District Justice Court in Pottstown keeps moving the date to avoid a media spotlight and crowds of Justice for Argus & Fiona supporters? Do the officials elected or otherwise in West Vincent have anything to do with this? I want to remain calm, cool and collected and avoid conspiracy theories, but I have to tell you when you have VERY reliable sources telling you the D.A.’s office in Chester County is telling THEM the date is the 28th of March again or this Thursday as in two days from now, yet when I call out to the court and speak to a lovely woman named Rebecca who asks me how I heard this because (and I quote) “It is not the 28th…nothing formally has been changed…but you can check the docket later.” well it is darn frustrating. So it seems to me something more is afoot. I can’t help but think someone is trying to sneak something past everyone AND the poor Bock family who have a right to their day in court for their beloved pets. 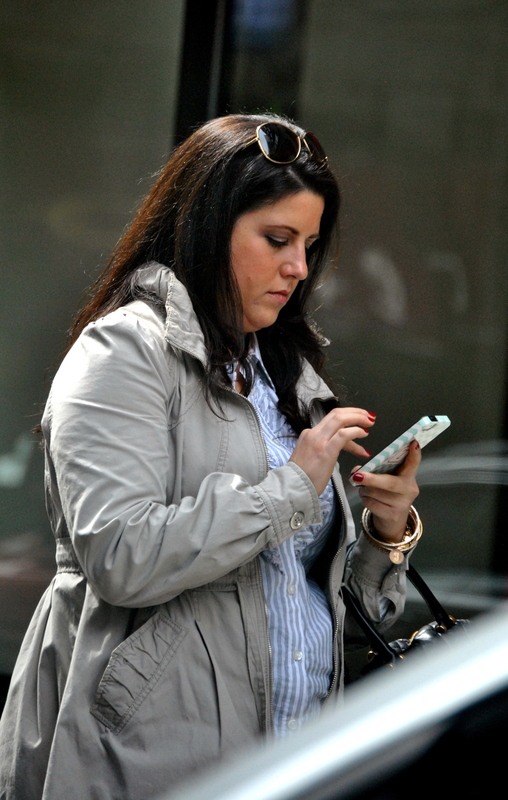 The Chester County District Attorney’s office telephone number is (610) 344-6801. Feel free to call D.A. Tom Hogan’s office and ask what the CORRECT date is and why the date to a simple hearing in a Magisterial District Court is jumping around quite so much. Regional and local media, you have been so incredibly generous in your coverage of this issue. We hope you can see all this Tom Foolery over the magically moving court date will encourage you to resume coverage. After all, will justice be so thorough without the eyes of the region upon her? Supporters of dog issues please watch the court dockets too. Apparently it is going to take more than a village to get justice after all. 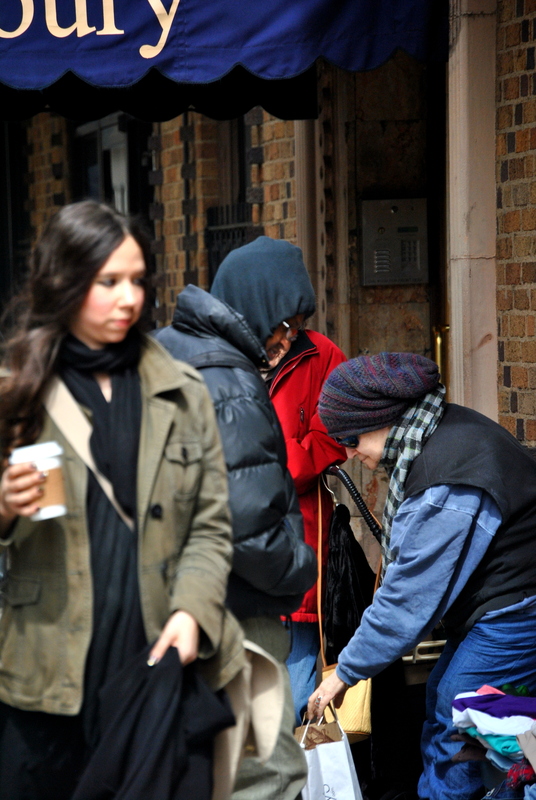 Sometimes the fun of being a photographer is snapping the unexpected and good candids. 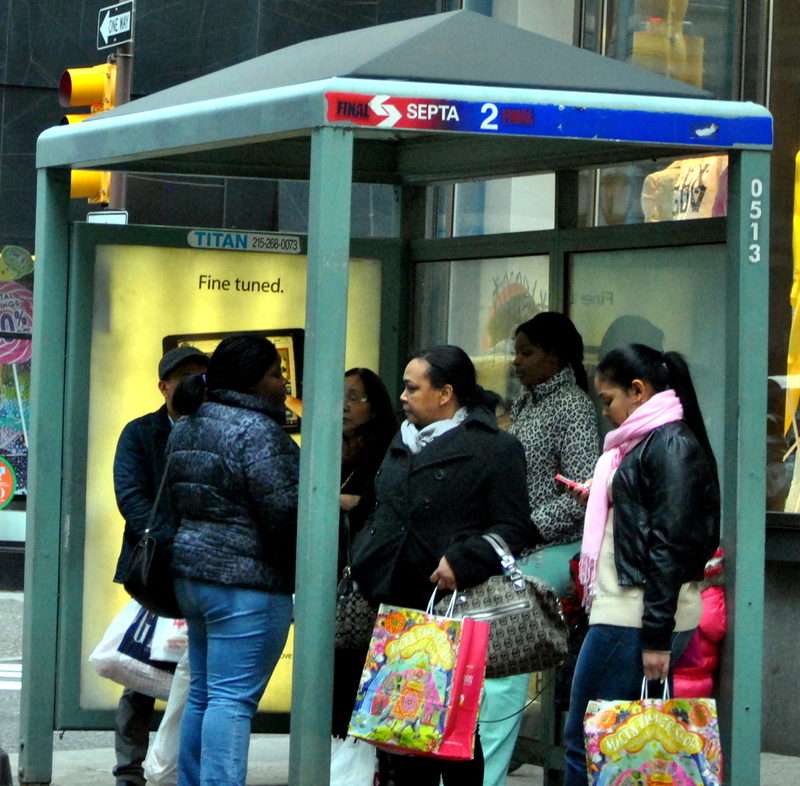 These were snapped in Philadelphia…it of course also reflects how attached we are to our smart phones and somewhat oblivious to life around us….